Before there was SAVATAGE, there was AVATAR. When in mid 1983, SAVATAGE’s sole album “Sirens” was released and hit the stores, many simply did not not what to think of the music. On one hand, with groups such as SLAYER, METALLICA, HAWAII, EXCITER etc., SAVATAGE sounded kind of dated in comparison. The music was slow, the melodic vocals were very dominantly placed. It was very much on the NWOBHM side of things, yet there was something about it that we used to simply call “american”. I guess what we meant was the clear and sharp sound and a certain technical level that put them ahead of most of what had been swept into the record shops of the early 80s. The band released this magnificient EP under the old monicker of AVATAR still, before deciding to go on under the banner of SAVATAGE. 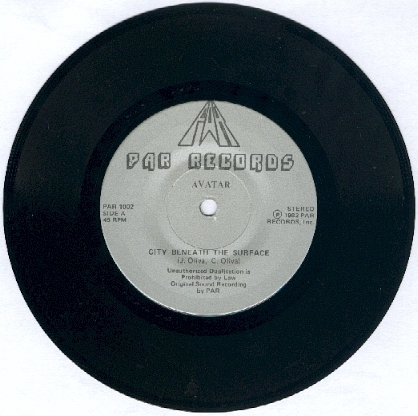 In 1984, when I originally bought the 7″, it was still available in record shops, so I decided to save some money for it (imports were really expensive at the time, though nothing compared to what you pay for this pearl nowadays, of course). The bands Ã¼berhit “Sirens” on the 7″ sounds very much like the version on the aforementioned LP, b but it’s a little bit more stripped down. Totally great, if you ask me! 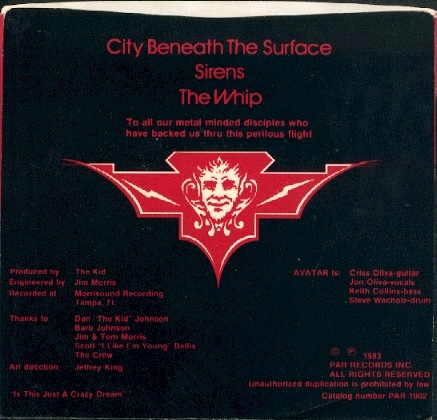 And the KRAFTWERK-esque intro to “City beneath the Surface” is such a killer. “The Whip” is weak and the thin guitar sound don’t help on this one. The redone version on “Dungeons are calling” is much better from what I remember. Recorded at Morrisound Recordings in Tampa, Florida and engineered by Jim Morris whose Death MEtal productions a few years later almost ruined a great genre. 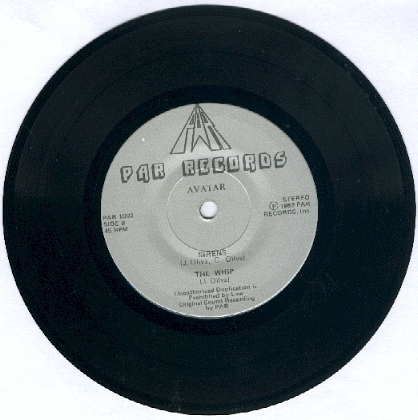 The original pressing of 1000 (25 of which on yellow vinyl) has silver labels. There’s at least one counterfeit of it, which is made with a lot of love for details (it has even the curved top of the sleeve). It can only be told from the original due to the white instead of silver labels. Since I sold my original copy long time ago, I first bought a bootleg on ebay, because it had the curved top and I thought only the original had it. I first did not remember the silver label, but as soon as I found out, I was extremely pissed because the auction description had said it was the original I bought. I was very lucky to find a reasonably priced original pressing with the silver labels two weeks ago. So if anybody wants the counterfeit (which is rare too), drop me a line. Post a comment — Trackback URI RSS 2.0 feed for these comments This entry (permalink) was posted on Saturday, November 8, 2008, at 08:25 by Admin. Filed in Metal. Thank you for putting this up. It sure beats the Der Club of Bore. Whohoo, Jay like something and itÂ´s do sound like Scorpions. I love this, so great even if Savatage peaked on their Hall of the Mountain King if you ask me. cheesefactor 10, really. only works for me in small doses like this. Maybe they should have done only 45s. loved the club of gore, by the way. There ain’t nothing wrong with cheese! Though I think this Avatar 7″ is excellent musically, it just didn’t seem to reach the heights of pretentiousness (megaexodusdeth) that I’m accustomed to. :). Thanks Erich. I hope you got this one off ebay a few weeks ago using buy it now. I took the time to ask the seller for details about it to prove it was the legit copy and by the time they got back to me it was gone. I don’t feel so bad now knowing it most likely went to you . Strangely enough, I haven’t heard this and I really love early Savatage, especially HOTMK. atavar, es heiÃŸt A-T-A-V-A-R ! 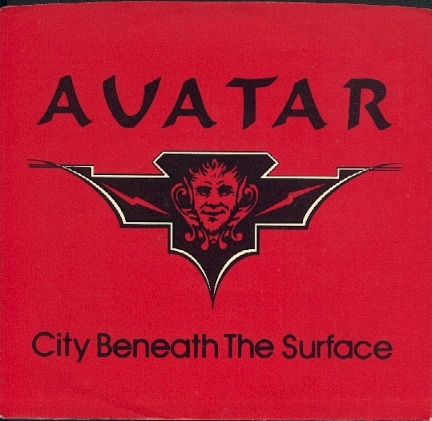 Do you still have that Avatar – City Beneath The Surface Bootleg?